Spring is a great time to plant an herb garden. Thyme should be one of those herbs that are essential to yours. Read on to see what wonderful endless benefits this herb has and what it can do for you and your family. Thyme is effective on Propionibacterium, the bacterium that causes acne. Thyme has a good antibacterial effect compared to benzoyl peroxide present in acne creams and face washes. Thyme contains an aqueous extract that can reduce blood pressure in hypertensive situations. Essential oils of aromatic plants like thyme can act as a natural preservative for food products. This can protect food from many common food-borne bacteria that lead to human illnesses. Thyme oil is effective for fighting bacterial strains of Enterococcus, Escherichia, Staphylococcus and Pseudomonas genera. Thyme can also protect from colon cancer. Wild thyme shows positive effects on breast cancer activity. This can stop the development of breast cancer cells. Candida albicans is a common fungus that can cause mouth and vaginal yeast infections. This is also known as “thrush” and can be cured with the help of thyme essential oil. This fights off the C. albicans to treat yeast infection in the human body. Skin problems are the most common in rural and urban areas. Traditional preparations made using the thyme plant are used as an alternative to synthetic medications. The extract of chamomile and thyme essential oil acts as an antifungal agent to heal eczema-like lesions. Thyme can be used to get relief from the symptoms of bronchitis like cold, cough, fever and increased production of sputum. Alopecia areata can be cured with thyme when combined with other herbs. You can apply lavender oil with thyme, rosemary and cedar wood essential oil onto the scalp to improve hair growth by 44% in just 7 months. Thyme has anti-inflammatory properties that are useful to cure chronic inflammation of the body. Thyme contains antibacterial properties that can fight many bacteria and fungi varieties like coli. Thyme oil extract is shown to fight against antibiotic-resistant strains of different bacteria. Thyme can improve your respiratory health. It is an orthodox medicine used for treating conditions of the chest and respiratory problems, including coughs and bronchitis. You can drink thyme tea by adding a few leaves to hot water. Allow this to brew and drink it to treat respiratory problems and a cold. Thyme is a rich source of iron that can give you 20% of the daily recommended allowance of iron for an adult in just 2.8 grams. Iron is required for the production of energy while iron deficiency can lead to anaemia, fatigue and low immunity. Thyme can improve your bone’s health, since this is a good source of Vitamin K, iron, calcium and manganese. These essential nutrients help in proper bone growth, strong, healthy bones and reduce the risk of many bone diseases. Thyme can fight off the bacteria causing skin acne. Herbs such as thyme are very gentle on the skin compared to other skin products, due to its anti-inflammatory properties. The thyme herb has thymol, an essential oil that has antiseptic and anti-fungal properties. The other essential oils found in thyme are carvacolo, borneol and geraniol. Thyme has many flavonoid phenolic antioxidants such as zea-xanthin, naringenin, luteolin, lutein, pigenin and thymonin. Fresh thyme herbs contain the highest level of antioxidants among all other herbs. Thyme can give you 0.35 mg of Vitamin B-6 or pyridoxine that meets 27% of your daily recommended intake. Pyridoxine helps to keep up GABA levels in our brain and hence is known as a stress buster. Vitamin C present in thyme is useful for the human body to develop resistance towards infectious agents. Thyme has Vitamin A that is a fat-soluble vitamin and antioxidant. This is essential for healthy mucus membranes and skin. This also keeps a check on your vision. Thyme is naturally rich in flavonoids such as Vitamin A and beta-carotene. Consumption of thyme can be useful for protection against lung and oral cavity cancers. Drink a cup of thyme tea as it has thymol, which is a potent antioxidant. This increases the level ofomega-3 fatty acids and healthy fats in your brain cells. Thyme oil can also provide protection against age-related changes in your brain cells. Thyme can reduce the risk of Alzheimer’s disease. Thyme tea also contains naringenin, luteolin, apigenin, and thymonin. Try a cup of thyme tea, if you have a cold or cough. This is useful to treat bronchitis and relieves cough. This is also used in many herbal preparations for its relaxant and bronchodilatory effects. Thyme tea is often advised by herbal healers to aid digestion, relieve gas and bloating. The volatile oils in thyme can reduce gas and act as an antispasmodic to provide relief from intestinal cramping. You can add thyme essential oils to soups and stews. This can be useful to increase the blood circulation in your body. Brewed in tea, thyme can energize your whole system and produce a fortifying effect on your nervous system. This can treat physical and mental exhaustion, tension, anxiety, pressure and depression. Modern science uses thyme to act as an energy tonic and an aid for longevity. Thyme’s volatile oils have antioxidant phenols and flavonoids along with vitamins and minerals. These protect your DNA against oxidative damage. Thyme is useful to get relief from winding and cramping in your stomach and bowels. This is also useful to treat an irritable bowel syndrome, diarrhea and bowel infections. Thyme can re-establish normal bacterial population in your gut. Thyme is being used since ancient times to maintain a healthy mind. Thyme is very effective against Shigella sonnei. This is a bacterium that can cause diarrhea. Wash lettuce in 1% thyme oil or thymol to reduce the number of Shigella bacteria. Thyme essential oils are also used as natural food preservatives. Thyme has volatile oils that protect your brain by increasing essential omega-3 fatty acids in your brain, maintaining healthy cells and slowing down the aging process. Hot thyme tea can be sweetened with a bit of honey to lower down fever caused due to perspiration. You can drink cool or lukewarm thyme tea for cystitis and an irritable bladder. You can also combine thyme with other soothing herbs like marshmallow and couch grass to clear excess uric acids from your system. Sometimes, thyme is also recommended to get relief from arthritis and gout. Thyme can also be used externally. The oil is mixed with warming liniments and lotions to be rubbed on aching joints and muscles. Thyme tincture can be added to some water. This acts as a good antiseptic lotion to cure cuts, grazes and mouth ulcers. 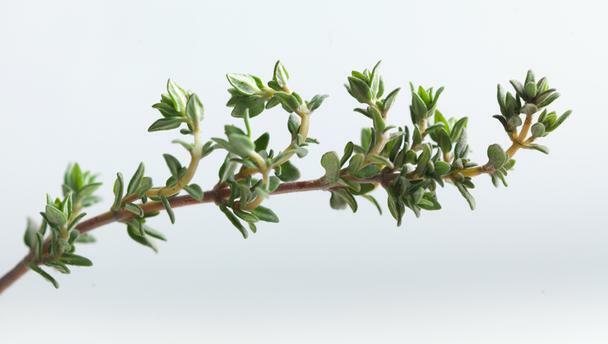 Thyme has anti-fungal properties which is why it is a good remedy to treat thrush and athlete’s foot. If you are feeling down in the dumps, thyme acts as a remedy to give you instant relief and ensures peaceful sleep. Thyme aids in proper digestion of fats. This is very useful to digest mutton or pork. Thyme also acts as a digestive tonic to increase one’s appetite. Thyme oil is beneficial for your body and widely used in many toothpaste, mouthwashes and ointments. This herb is also best for gargle and mouthwash, for preventing dental decay. This is also effective on plaque formation, sore throat, mouth sores, laryngitis, tonsillitis and bad breath. Thyme has thymol that has antiseptic properties. This can be used as a poultice to treat insect bites, stings, mastitis, wounds, hookworm, threadworm and roundworm. This is also beneficial to destroy skin parasites such as scabies and lice. You can use thyme as a hair rinse. This helps to prevent dandruff. Thyme has antispasmodic properties that give relief to women during menstruation. How do I use Thyme? There are many ways you can use thyme to help with these ailments. Tinctures, teas, salves, oils, diffuser and more!There are many suggestions above but if you have a question as to how you should use it for yourself in some way, simply reach out and ask! I am hear to help. Just email me and I will quickly respond. How Does Thyme Oil Work? Relieve pain – Mix three drops of thyme oil with two teaspoons of sesame oil. Use this mixture as a massage oil and apply on the abdominal area to relieve pain. This may also be used as a massage oil to treat other types of pain. Alleviate fatigue – Add two drops of thyme oil to your bath water. Improve sleep – Add a few drops to your diffuser. Promote oral health – Use thyme oil as a mouthwash by adding one drop to a cup of warm water. Reduce appearance of scars and skin marks – Apply oil of thyme mixed with any carrier oil (like almond oil) on the affected area. Use as cleanser – Add a few drops of thyme oil to your facial wash. Treat or protect against respiratory problems – Add two drops of thyme oil to hot water and use for steam inhalation. Uplift mood – Simply inhale the scent of thyme oil. Do you have an herb garden? If so, what herbs are you planting this spring?